Step back in time to Portland, Maine, in 1896. When the young, beautiful, redheaded Cordelia Underwood inherits a parcel of land from her seafaring uncle, it sets in motion a chain of events that leads to the unearthing of a family secret two centuries old. Cordelia soon crosses paths with Mister Tobias Walton and finds herself aided in her quest by the warmhearted gentleman, who has never heard of an adventure he isn't eager to join. Together with his hapless trio of friends, the Moosepath League, they embark on an entertaining and audacious adventure. Teeming with Cupid's arrows flying hither and yon, apparitions, a kidnapping, smuggling, and thievery, and filled with wonderment, romance, and adventure, Cordelia Underwood is a splendid yarn of the old-fashioned variety. Van Reid's family has lived in Edgecomb, Maine, since the 1800s. Reid lives with his wife and children in a house Reid and his brother built on their family's land. 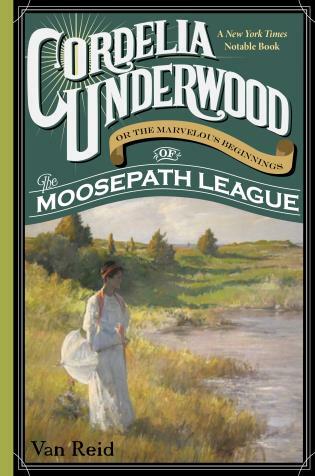 His series of novels about the Moosepath League--of which Cordelia Underwood is the first--take place in the late 1800s on coastal Maine.